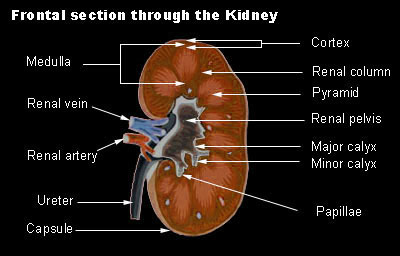 The kidney is involved in several things, in addition to urine production. Erythropoietin is produced in the kidney. Vitamin D is modified in the kidney, specifically, there is the addition of hydroxyl groups. The kidney plays an important role in acid base balance. Renin is produced in the kidney. The kidney can be divided into an outer cortex and an inner medulla. A kidney lobe consists of a medullary pyramid, its overlying cortex, and the associated renal column. The renal columns are the tissue in between the pyramids. A region where a portion of the medulla project into the renal cortex are referred to as medullary ray. Large collecting tubules near the apex of the pyramid are the ducts of Bellini. The ducts of Bellini are also called a papillary ducts. The functional unit of the kidney is the nephron. 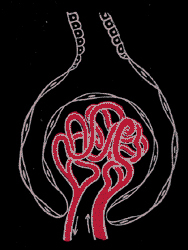 The nephron can be divided into the glomerulus and uriniferous tubule. 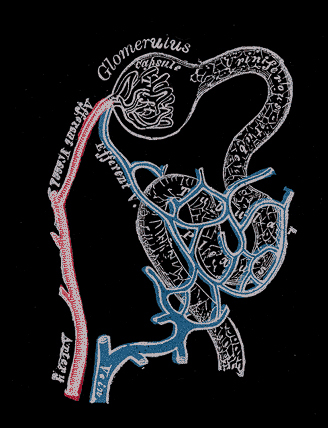 The capillary tuft of the nephron is referred to as the glomerulus. Bowman's capsule is a double layered cap surrounding the glomerulus. This is the first portion of the uriniferous tubule. The glomerulus and Bowman's capsule make up the renal corpuscle. Another term for the renal corpuscle is Malpighian corpuscle. Bowman's capsule leads to the proximal convoluted tubule. The proximal convoluted tubule leads to the loop of Henle. This then leads to the distal convoluted tubule. The distal convoluted tubule then leads to the collecting duct. called podocytes. The outer layer of Bowman's capsule is the parietal layer. Pedicels are the foot processes on the podocytes. Histology hint from Sarah Bellham: The Latin prefix pedalis, pes and pedis refers to the foot. Such words include pedal, pedicure, pedestrian, and pedicels. The juxtaglomerular cells secrete renin. The macula densa are specialized cells in the distal convoluted tubule that are sensitive to sodium. The juxtaglomerular cells and macula densa make up the juxtaglomerular apparatus. The afferent arteriole branches off the interlobular artery. The afferent arteriole supplies blood to the glomerulus. The glomerulus is a capillary tuft. The glomerular capillaries converge to form the efferent arteriole. The peritubular capillaries is a second capillary network which arise after the efferent arteriole. They surround the proximal tubule, loop of Henle, and distal tubule. Vasa recta are the "straight vessels" which arise from some of the efferent arterioles.